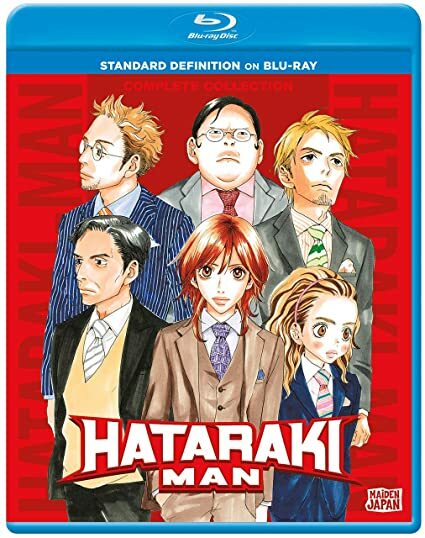 Hataraki – Man - BUY THIS DVD! Hataraki-Man contains episodes 1-11 of the anime directed by Katsumi Ono in standard definition on a blu-ray disc. It's hard to get ahead in the publishing industry and it's even harder when you're a woman in Japan, where only one manager in ten is female. Despite that, Hiroko Matsukata's determined to reach the top, and at only 28, she's worked her way up to an editor's position at Jidai weekly. But to get that far, Hiroko has had to dedicate her life to work, work, and more work while suppressing her more feminine character traits in order to blend in with her uncouth male coworkers. Just because the other Jidai employees have nicknamed her "Hataraki Man" (Working Man) doesn't mean that she wouldn't like the chance to be a bit more girly and have some romance occasionally. Unfortunately for Hiroko, her sometimes boyfriend is an even bigger workaholic than she is. THEN SEND IN YOUR NAME AND ADDRESS TO contests@efilmcritic.com. Put "I AM A HATARAKI MAN!" in the subject line and cross your fingers. We will draw names and one of the packages could be yours. Only 1 entry per household.